We created the THINK system after over thirty years of international and interdisciplinary research with the vision of expanding cognitive potential. Dr. Morrow was awarded the Galileo2000 Prize, the European Equivalent of a Pulitzer representing a wide array of disciplines, in 2013, for her groundbreaking work in neuroscience. We are passionate about helping our clients elevate focus, memory, longevity, and cognitive performance. Research partners include scientists and representatives from Columbia University, New York University Langone Medical Center, Mount Sinai Hospital, St. Pau Hospital, Barcelona, and Sapienza University, Rome. Rigorous pre and post fMRI tested, analyzed and verified at Columbia University, US and University of Barcelona, Spain, and Mt. Sinai School of Medicine NYC. fMRI results show significant increase in brain activity in many important areas. Evaluated using industry standard ADHD test Conner’s CPT II Test (CPT II) in a 2 year double-blind controlled study of 62 ADHD children 6-18 years old. Scientifically developed questionnaire (26 y/n) filled out by student, educators, and parents, tracked over a 13 week period. 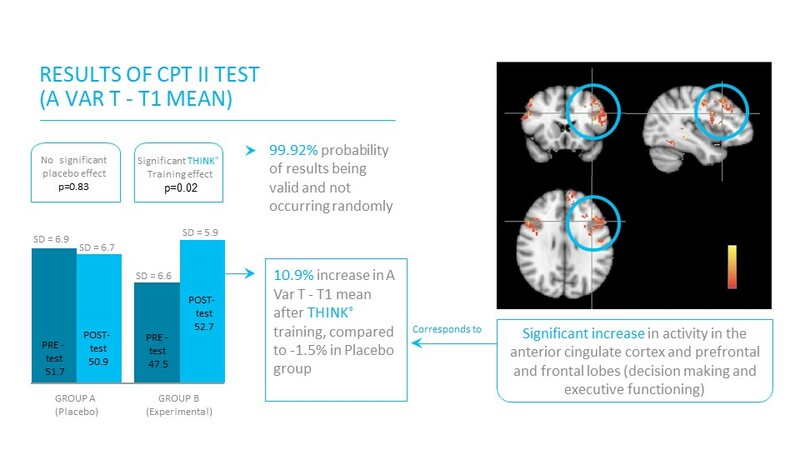 Rigorous Testing by HoneyBee Robotics, Yale University, and Saint Pau University demonstrated the THINK® device to be equal to or more accurate at reading brainwaves than other wet or dry EEG devices.